1. The Mega Casino Box is made of transparent material which allows the contents and the seal to be visually inspected. 2. 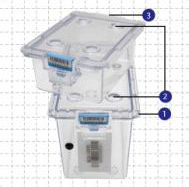 Lid design allows for good stacking of boxes on top of one another and to save space in transit. 3. The sliding lid has a back-stop mechanism to prevent the lid from slipping off.